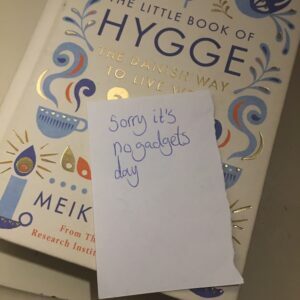 So the almost-12-year-old had decided that she’d seen enough of her mother wielding phones and laptops of late and had indeed declared a No Gadgets Day. Hmmm. It’s easier said than actually done, however. Around 98% of my work is online, with nearly all of it requiring an internet connection. That’s a massive chunk of anxiety right there, when not only had all of my bloody devices been confiscated and hidden, but said child had also disconnected the internet too. I know, I know, Sundays should be sacred and family time and all that jazz, but honestly, my work does not fit into neat little boxes of nine-five hours, Monday to Friday. My working hours are bespoke and varied. But OK, let’s go with the No Gadget Day. Deep breaths. Running mentally over scheduled posts, emails to send/reply to and strategies to complete, panic set in a little. The gadget-confiscating child was being terribly strict and had even got The Dad on-side. I was allowed five minutes’ access to emails only at 13.00hrs and then nothing until the end of the day. At this point, I was feeling a little nauseous. I’m not a TV person really. I can’t remember the last programme I watched. I occasionally like catch-up documentaries or the like, and I love DVDs and Netflix sessions. I enjoy a silent house too: I don’t always appreciate music on in the background – noise grates on my nerves, especially when I’m writing. But I always have a device of some sort close by. The house was so peaceful today. No children watching their tablets or iPads, no husband watching morning politics shows, which are guaranteed to make your blood pressure rise. And no phone or Mac to access. My fingers were instantly itching for things to do. I’m so used to tapping away on my Mac, or whizzing through clients’ social media accounts “just to check”. I rarely use a physical pen and paper these days. It felt really liberating to scribble away on a jotter pad for a while, and I felt the ideas flow better than having a constant distraction of emails and the unending intensity of social media. I had several brainwaves today – I haven’t felt freely inspired like this for a long time. The constant juggling of clients and campaigns can leave me feeling jaded, but having that space away from time-sucking devices was really rejuvenating. So after a few hours, I finally relaxed. I managed to get a whole load of jobs completed that I’ve been putting off for ages. The children took the opportunity of being gadget-less to play in the garden, while The Dad enjoyed a rare hour of resting in a comfy chair, accompanied by a Sudoku book and coffee. We also enjoyed a walk in the woods, mobile phone-free, and the children followed a quiz trail as we wandered together. Modern day life has become so reliant and absorbed in technology. It’s not necessarily a bad thing however, but it does need to be monitored before an imbalance arises. I’ve previously written on time management, and I’m regularly checking myself to ensure I maximise my work hours and minimise potential distractions. It’s all too easy to get ensconced in a virtual, online world where time gets sapped away and real, tangible life passes you by quickly. I think we’ll be having regular No Gadget Days in the future. Hopefully, I’ll get a warning before the next one though, so I can prepare for my workload in advance!